Did you know the first governor of California was from Tennessee? Born in Nashville in 1807, Peter Burnett established a lifelong pattern of wandering as he constantly quit jobs and moved west. Following a series of occupations, he owned a store in Missouri and practice law in Oregon, where he was a member of the Supreme Court. In 1848, Burnett joined the California Gold Rush and, finding no gold, made a living selling lots in the new city of Sacramento. The following year, he entered politics and became the state’s first governor. During his time in office, Burnett proposed several unpopular policies, including imposing the death penalty for robbery. In 1851, he faced mounting criticism from the legislature and the press and resigned from office. 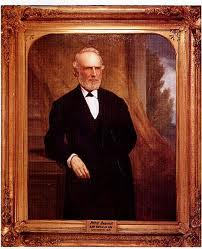 Despite this apparent failure, Burnett later served on the California Supreme Court and died a wealthy man in 1895.